Having to find a plane ticket to Dublin quickly to visit a conference, we noticed that this was now possible through a chatbot as well. We engaged with the chat and quickly we started answering the questions that were necessary: where do we want to go, what level of comfort did we want etc. Within 10 minutes we had our flight booked and we had not encountered a single point of inquiry or information that was not otherwise necessary. Wouldn’t it be great to be able to engage with your business applications the same way? And if your employees have this experience in every digital part of their life, why don’t they have it yet within your company? Being able to get a prompt the moment you need to approve something, with all the context you need to make that decision at your finger tips. Instead of having to chase someone for their signature and their reluctance to engage in the approval system, it’s likely that they don’t mind replying to that quick message while standing in line at the airport. The business results are evident: people will reply quicker, will not have to browse through hundreds of emails and will only engage with information that is relevant. The above describes just two use cases: ordering a ticket for a journey by plane, and approving a sales order. The examples of applications that support specific cases are both evident and abundant. The key differentiator for your business would be to define this rather easily yourself. As described in “The necessity of choosing an open ERP” , being able to differentiate in the areas relevant to your business is becoming increasingly important. In recent years we see with several clients their focus and priorities are shifting. From a focus just on their business process, the voice of the employee is becoming more important. If a user uses is able to use the system better, it is likely your data quality is better and they will do more in your system. Employees expect the same user experience they encounter in their personal use. Being it from banking anywhere with just your thumbprint, to shopping from your couch. With qualified resources becoming scarcer, providing a user friendly IT environment can retain employees or even attract them. This focus in addition will often allow for more productivity as employees more actively engage with the business processes instead of avoiding them. In order to work efficiently, an employee wants as few applications as possible on his phone or device and wants the most unified experience possible. Needing a different application for everything becomes both tedious, and defeats the purpose: ideally all your activities happen in one integrated experience. Wouldn’t it be great to communicate with colleagues, approve deals, request simple statuses and be notified of actions all in one platform that is accessible across your devices? This can be done with tools like Slack, Microsoft Teams and others. Slack has become increasingly popular in recent years as a collaborative tool within organizations. It has the premise of replacing email within your organization. In our view, the biggest benefit is in its integration. As described by its Chief Product Officer April Underwood to Recode Decode (September 5th 2018), Slack should really be seen as a platform that is aiming to integrate into all communication of the worker. Using it internally within our own company we noticed that a formal announcement was not even needed for adoption. Within a matter of weeks, people started asking whether they could use it as well. Now constantly aware of open tasks as we integrated Slack with JIRA and not having to digest a multitude of emails, it is widely used all around. The business case for our clients is often even larger. We see with many clients that many processes are delayed due to waiting for approvals. In addition we see that many clients are experiencing tiredness of emails, mostly prompts of having to approve something or notifications of updates. Because of this, informing people of an urgent matter quickly can often be difficult. In the case of commodity traders this often translates directly into a financial return. Especially given that traders expect a system that facilitates them, instead of one which is experienced as an administrational burden. Cadran has now implemented an integration between Slack and JD Edwards, and is able to integrate this in a workflow and with chatbot functionality. In the scenario that we chose and demoed in a life environment, a sales contract is put to a “waiting for approval” status. 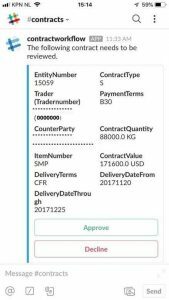 Slack will show the user a summary with predefined contract fields, allowing the approver to quickly see what needs to be approved. Ready to Approve? 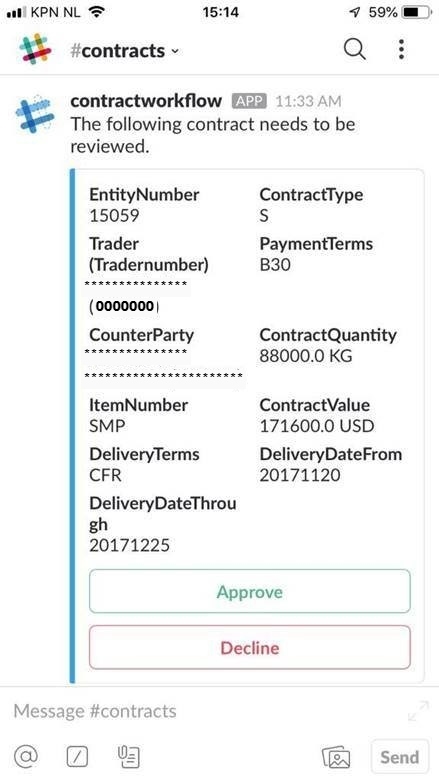 Slack will notify JD Edwards and the user will get a prompt indicating the new status of this sales contract. In the future we’ll add the possibility to then request a full PDF print of that contract to receive more information. As Slack can be accessed from every platform, the user can undertake these actions from any place, in the same application that he or she already communicates in with colleagues. In a relatively small amount of days we can have the platform for this up and running for your organization. The question is: what is the workflow or scenario you want to bring to live? For this we would love to start workshops with you to identify these scenarios. Interested? Approach Mark Kamphuis for more information.